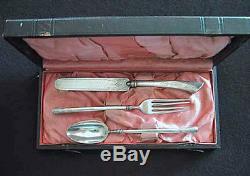 And rather rare antique Sterling Silver Child's Flatware Set, in its original case. 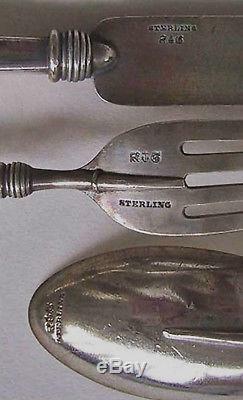 The gorgeous antique Sterling Silver Child's Set (Sterling Child's utensil set/cutlery set) dates to circa: 1870 and was made by Gorham. The three piece antique Child's Set is possibly the Angelo Pattern by Gorham. The pattern has Bright Cut designs on the curved, semi square hollow handles and the Knife has a Bright Cut on the blade as well. The three piece set includes a Knife, Fork and Spoon. 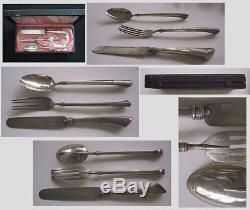 (KNIFE measures 7 3/4" long) (SPOON measures 6 1/2" long) (FORK measures 6 7/8 long). Each with a faint, period script monogram, that looks to read: GMcAB?? Each piece is hallmarked on their reverses with the Gorham hallmarks (Lion, Anchor, G) and Sterling. The Original Case is very pretty---with the interior lined with pink satin? The Set is in fine condition with normal minor surface scratches. The case has some wear. This is a wonderful antique set, made for children! Rare to have the original case! 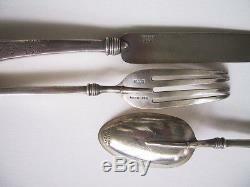 The antique Childs Sterling Sliver Flatware Set is so much prettier and more detailed in person! The Set shows reflections of the room while being photographed. For International sales and sales within the U. NOTE: if the item is received damaged, we are to be notified within 24 hours of receiving. Please note though our items are well described, it is not possible to note every minute blemish, although we make every effort to do so. The item "C1870, Angelo STERLING CHILD'S SERVING SET GORHAM, Original Leather Case (O36)" is in sale since Thursday, May 8, 2014. This item is in the category "Antiques\Silver\Sterling Silver (. The seller is "hwantiques" and is located in Wynnewood, Pennsylvania. This item can be shipped to North, South, or Latin America, all countries in Europe, all countries in continental Asia, Australia.